New book, 96 pages with one black & white and 83 colour pictures, 24 tables and six pages of drawings. Following on from Harpia Publishing’s acclaimed two-volume Russia’s Warplanes series, author Piotr Butowski takes on the subject of the myriad weapons that ensure these aircraft are a force to be reckoned with. 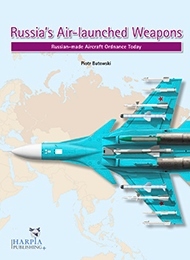 For the first time in the English language, this volume presents a detailed account of all the types of weapon currently used on board Russian-made aircraft and helicopters, including Cold War-era munitions, the various weapons used by Russian aircraft during the Syrian campaign, and the latest precision-guided stores currently in development. The contents of this work encompasses the strategic air-launched weapons that comprise a vital element of Russia’s nuclear forces, including little-known free-fall bombs, strategic and theatre-level air-to-surface missiles, and future projects such as exotic hypersonic weapons. Significant coverage is given over to the uniquely diverse range of tactical air-to-surface missiles, including details of their production, guidance methods and applications, with exhaustive tables of specifications. Study of Russian air-to-air missiles includes close-combat, medium-range and long-range types, while inclusion of helicopter-launched missiles extends the scope of the work to anti-armour weapons. As well as free-fall and guided bombs, offensive stores under scrutiny include rockets of all types, while a chapter on naval weapons includes important stores ranging from anti-submarine torpedoes and missiles to depth charges and various types of mine. Not neglected are the guns and gun pods that make up an important part of Russian aircraft’s arsenals. Clearly written and illustrated with both photography and artworks, Russia’s Air-launched Weapons provides the most comprehensive single-volume study of its subject currently available. Drawing upon the author’s extensive research, declassified information, and interviews with specialists, it provides a plethora of data on a fascinating and important area of military study. This book is an essential addition for anyone interested in Soviet military aircraft and their use in combat and provides an ideal companion volume to Russia’s Warplanes volumes 1 and 2.